For the second time in under two weeks, Hamas is claiming that the rocket fire to central Israel early Monday was a “mistake.” Hamas made the same claim ten days ago, when two rockets were fired at the Tel Aviv area. The IDF rejected that explanation, saying that it held Hamas responsible for the rocket fire. Meanwhile, Islamic Jihad warned Israel not to retaliate for the attack. 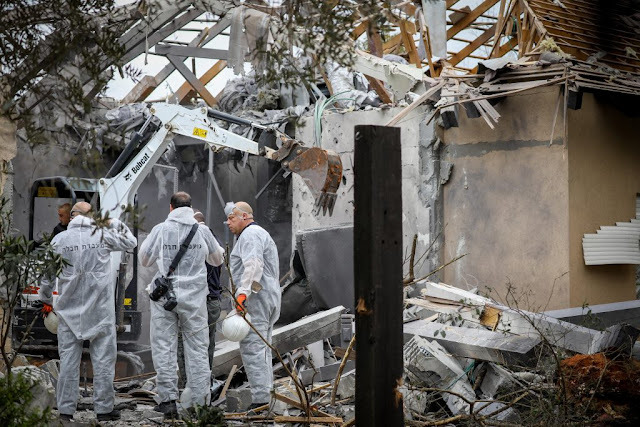 Yediot Acharonot said Monday that after the rocket fired from Gaza hit a house in the town of Mishmeret in the Sharon region, north of Tel Aviv, Hamas contacted Egypt, telling officials that the rocket had been fired in error. Seven people, including an infant, were injured in the attack, with the family’s home sustaining heavy damage. Several other neighboring houses were damaged as well. Egypt transferred the message to Israel, but in a statement, the IDF said it was not accepting the terror group’s excuse, and that it held Hamas responsible for the attack. The IDF is sending two divisions to the Gaza border area, its spokesperson said, and was conducting a limited call-up of reserves. A report on Kan News said that top terrorists in Hamas and Islamic Jihad had gone into hiding, anticipating a heavy Israeli response. Meanwhile, Islamic Jihad warned Israel not to retaliate at all, because any retaliation would be met by rocket attacks “deep in the territory of Israel. The leadership of Israel knows we will strike back with power to such attacks,” the terror group said. Groups allied with Islamic Jihad said that the attack was due to retaliation by the Prisons Service against terrorists who had attacked and injured Israeli guards in Ketziot Prison Sunday night. The thought that this was a second "mistake" is way too far fetched to be believed. Much more likely is that it was done by Islamic Jihad and Hamas is covering up for it to try to minimize the Israeli response. Islamic Jihad did not admit or deny firing the rocket. It is worrisome that the warning sirens were not activated by this rocket.